A corn dog thief is on the loose in South Carolina, police report. A Myrtle Beach woman told cops that she returned to her home yesterday afternoon and found a male intruder “just inside her door eating a corndog.” The 30-year-old victim said that she recognized the man as someone she had met last year (but whose name she did not recall). When confronted by the homeowner, the suspect “said he was hungry and stopped by to get something to eat,” according to a Myrtle Beach Police Department report. The suspect peddled away from the crime scene on a bicycle owned by the woman, who told cops that her phone was also missing. 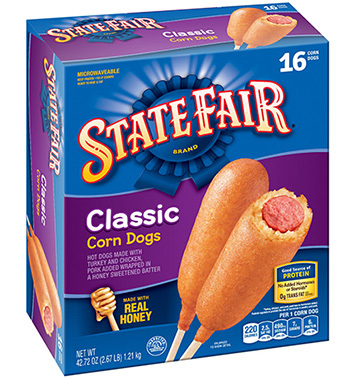 In a bid to identify the intruder, an officer processed a State Fair Corn Dogs box for fingerprints. However, the corn dog container, which was found on the floor, provided "no viable prints." Police described the suspect as a black male between the ages of 35 and 45. If apprehended, he faces burglary and breaking and entering charges.